healing is natural, healing 24/7 as nature intended. 1. Start with good clean water fill a container place it in a window sill of your house where it will be exposed to sunlight and moonlight. Leave it there for a full 24 hour period. Now your container of water has been decontaminate and energized by the sun and moon. The FM is a Capricorn Moon / CANCER Sun FM. Looking at the positions of Jupiter and Pluto, I would estimate this to be more of a FM to “excess” than others are. People often take unnecessary and foolish risks during the summer, and this FM confirms that this weekend will be a dangerous one for some. New relationships will seem particularly intense, and tensions will run high in existing ones. Jupiter is very late in CANCER and may, in fact, be void of course. v/c is generally viewed as an unfavorable time; most of the time it is discussed in relation to the Moon because the Moon v/c window occurs every 2 to 3 days. Jupiter v/c occurs about once a year, and this one coincides with a FM. Interesting to an astrologer and almost certainly dangerous in some way. The essence of all healing is ultimately love. A situation in your life or an aspect of you is asking to be healed right now. Regardless of what method, technique or therapy you choose, true healing which stems from the spiritual heart of creation, only occurs through love. 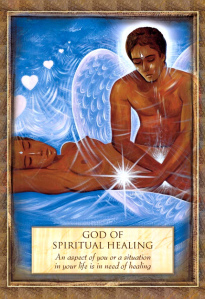 The God of Spiritual Healing has appeared in your reading today to send you light and love. CIA Admits UFO Hoax-Or Did They? Formed to replace the OSS after World War Two ended in 1947, these are the shady guys who you can blame for everything from the JFK assassination to any secretive operations in the United States or abroad. They are the guys that rule the suspense and thriller movie genre. Being a 21st century kind of agency, they recently found themselves with a Twitter account. And while they have not released the location of Jimmy Hoffa or told anyone that Ronald Reagan was really a robot for most of his terms, they have tweeted about being responsible for the wave of UFO sightings in Norway in the 1950’s.